For details on the background behind this project series, please visit my Reclamation Project page. The teacher of my preschool would scold or punish the entire class for one child’s misbehavior. I never understood why I got yelled at when Johnny picked his nose. I did not understand what I had to do with Suzy talking during quiet time. So I withdrew. During play time I sat alone in a corner working on crafts that other children did not like. Now that I am older and looking back, I wonder if my constant feelings of guilt and social anxiety are truly because it is my nature, or whether I was heavily influenced by that (toxic to me) environment. 1. make (someone) feel guilty, especially in order to induce them to do something. I have felt guilt for things that I was not responsible for, and I have felt guilty because of manipulation. What I am realizing is how my inaccurate feelings were keeping me locked behind invisible barriers and those feelings were manifesting into social anxiety and fear. 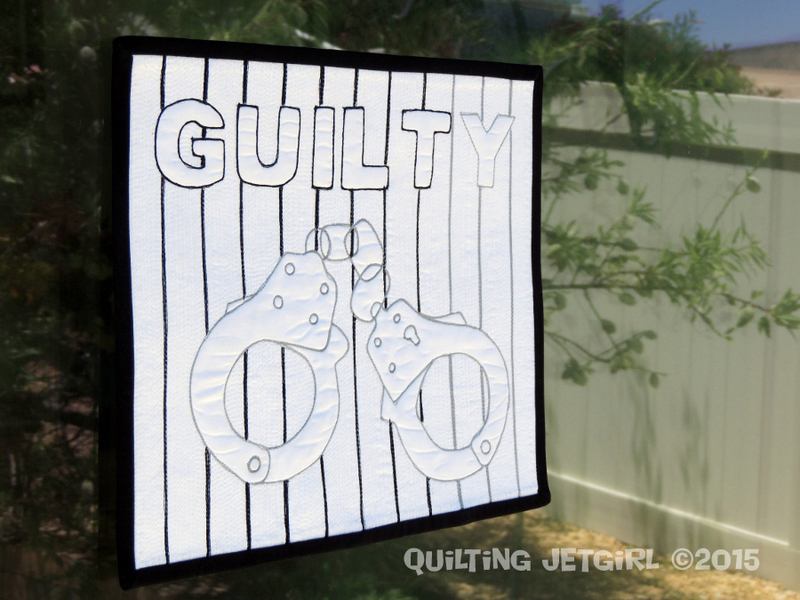 As I worked on this mini quilt, I thought about the differences between guilt and the feeling of being guilty. I want to break out of the confining bars that I have been placing around myself, so I began to recognize and look for patterns of guilt in my life. I should have no guilt about the behavior of the woman in line in front of me at the grocery store. I want to learn to breathe into those moments and find the quiet places of calm within myself. Memory itself is a malleable thing. It would be nice if matters were always clear cut / black and white, but there are many shades of grey in my life and reality. The stark colors I chose for the quilt do a nice job of emphasizing this point. To continue the process of letting go of these feelings that do not serve me, I want to actively chose to remember the good that is in my life. Realizing that I am responsible for myself and not responsible for the actions or behaviors of others is a huge step toward breaking out of the chains of guilt I have been placing upon myself. Have you felt guilt and responsibility for something unrelated to you? How did you process and move away from those feelings? Very interesting post. And a beautiful finished project. A very thoughtful post. What a neat project to go along with it. Well done and very well written Yvonne! Dealing with guilt is hard enough. Feeling guilt for what others do, not so much. I think the fact that you recognize this and are facing it head on is amazing! Catholic upbringing here too – guilt was a weekly thing with confession when I was a kid – not that we bold or anything. just normal! I think being aware of the feeling, what is causing them and why, and thinking through them critically is a big part of moving past them. And when they occur again, acknowledging them and somehow separating them from yourself? I think this quilt turned out wonderfully! A very thought provoking post. Guess we were both working on thread painting projects, only with totally different motivations. I don’t think I take on guilt for others, Yvonne, though I think I struggle with my own guilt. I have such clear memories of mistakes I made as far back as toddlerhood that I’ve spent years wondering if others remember and are annoyed with me about (based on what has recently become of my memory since becoming a parent, though, I suspect my mom has long forgotten that specific mean comment on x day in 1979 lol). As for the whole classroom punishment part, I agree that it’s not productive, though I think it usually made me mad as a kid to be subjected to it as opposed to feeling guilty by association. Yet another interesting and thought provoking piece in your ongoing project! Focusing on the positive is a great idea. And you do that so well with your Quilty Thankful Thursday posts. I think recognizing your feelings is a great step to moving past them. This is so thought provoking. I love how you are combining poetry with quilts. Guilt can mean so many things and it’s cool that anyone who looks at this will take it in a different way. A fascinating post. Thank you for sharing these thoughts Yvonne. I assume it can’t have been easy for you. I too carry a lot of guilt, and much of it comes from my childhood, yet continues to assert itself. We all need to find a way to move on from the damaging bits of our past, while remembering the positive lessons we learned from them. It’s tough. 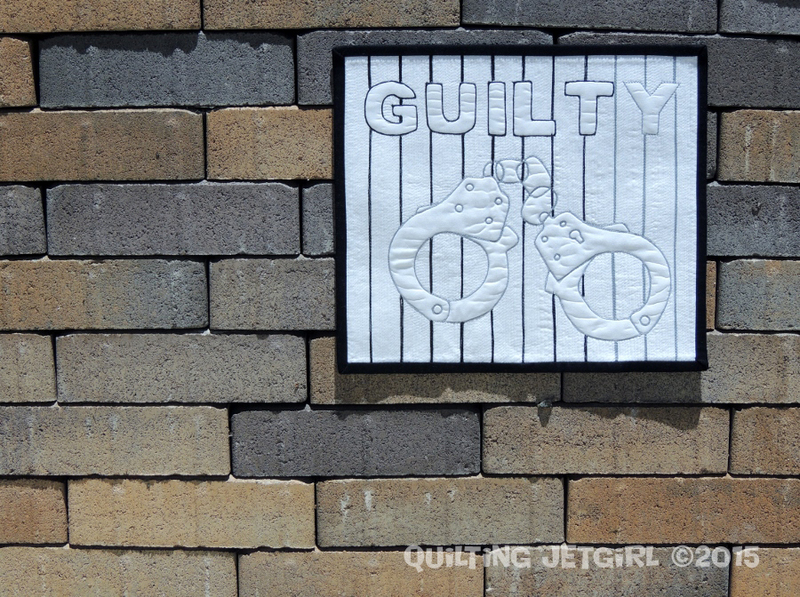 I love what you’ve done with the quilting. 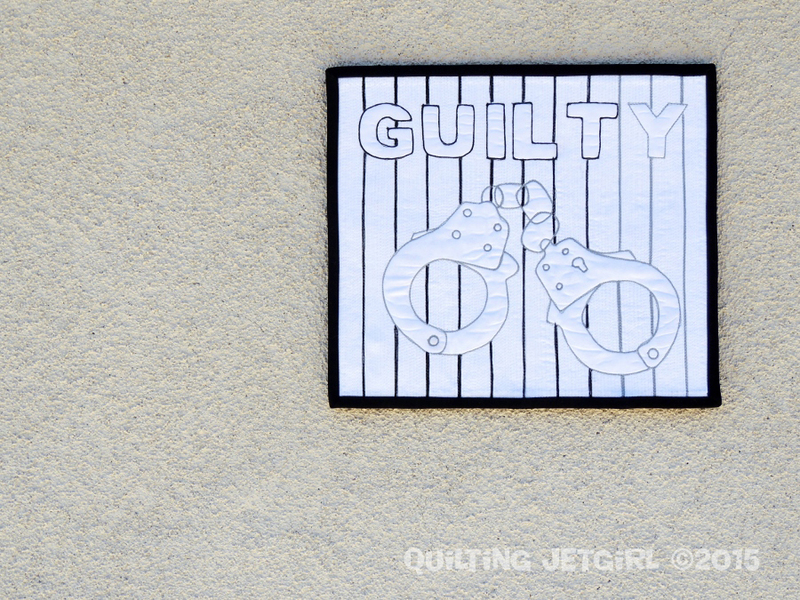 Did you use a pattern for handcuffs, or are you remarkably talented at making the things you quilt look like what they are? I’m sure environment has a big part to play as well as any genetic predisposition. Hoping you manage to put into practice your positive words now. This is beautiful Yvonne. I love your take on these different emotions and how you are translating them into works of art. Yes, like everyone, I have felt guilty about the behaviour of someone else that was not my fault. Sometimes it just takes time to process the real information and think my way past it. I think everyone has at least one disastrous teacher like at some point during their childhood. Sometimes quilting can be the best therapy. A time for reflection on your thoughts and feelings; an avenue to release the energy we feel, both good and bad, and turn it into something constructive. This was a beautiful post. You put a lot of thoughts into these pieces. How brave of you to share with all of us! Guilt is a very unusual animal and really motivates many people to do things they don’t want to do or feel an obligation to do. It’s something that’s very personal to me right now with some family issues. Being raised Catholic has a lot to do with it. It seems that the Catholic faith play off of guilt, at least when I was a kid. I remember going into confession, where I’m supposed to be telling my sins to a priest, and making things up, actually LYING because I felt guilty that I didn’t do enough bad things. That is totally f’ed up. It’s taken me years to let go of guilt over things that I shouldn’t feel guilty about and my experiences through my religious upbringing was the source of most of it, which is why I am not raising my child in the Catholic faith. Any sort of relationship, whether it be with your partner, spouse, friend, higher power/god, should not be built upon a foundation of guilt. Now, on to your mini – I like how you did the subtle switch from black to gray to show that guilt isn’t aways all black and white. 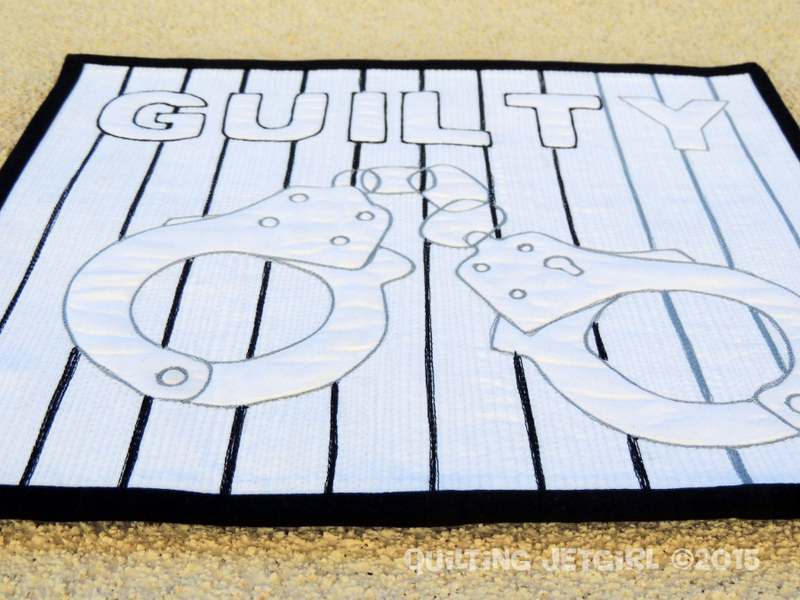 I’d be curious to see if you were to re-make this same quilt a year from now to see if one of the handcuff sides would be unlocked and open to show that you’re breaking free of it. I have also experienced the “guilt by association” that you felt as a child. Perhaps we have all experienced THAT teacher. Anyway, I was a quiet, sensitive, shy child, too, but I guess I didn’t internalize the abuse to the degree you did. My Mom probably helped me to externalize it and see it as the teacher having a hard time managing the kids. We moved a lot, so I experienced a variety of “teaching styles”. I learned that teachers are people with personalities of their own and, while some are lovely, some of them are just not that pleasant. I hope you are finding ways to re-frame and externalize your experiences so you aren’t burdened with emotional “jobs” that are not your responsibility. Your quilt is fantastic, by the way. Great design, beautifully executed. Well done. I think at one point and time most (if not all) go through this… all in different extents and degrees. While I don’t personally relate to the experience(s) that probably created and/or helped create those feelings, I complete can understand and it would make sense. What really makes me feel so great for you is your self-reflection in yourself and acceptance as well as will to change it to where you would like to to be. That is brave. 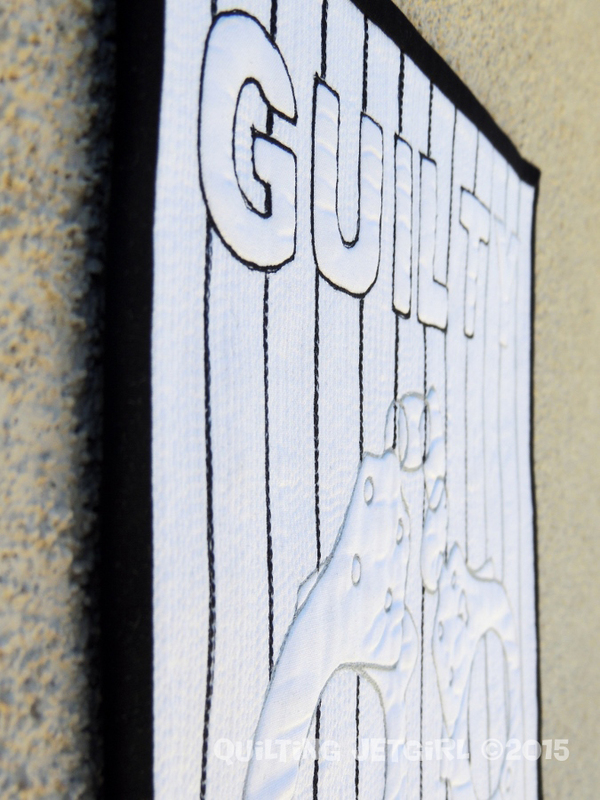 The quilt you created for it speaks very powerfully and loud. Watching it grow when you were working on it was definitely lovely as it continued to speak louder and louder as it slowly came together; now seeing it all in its whole as well as knowing the feelings and story behind it, it is more than just a ‘wall hanging’ or ‘mini quilt’… bravo.